For other ships with the same name, see USS Bunker Hill. "CV-17" redirects here. For the Chinese CV-17, see Type 001A aircraft carrier. USS Bunker Hill (CV/CVA/CVS-17, AVT-9) was one of 24 Essex-class aircraft carriers built during World War II for the United States Navy. The ship was named for the Battle of Bunker Hill in the American Revolutionary War. Commissioned in May 1943 and sent to the Pacific Theater of Operations, the ship participated in battles in the Southwest Pacific, Central Pacific and the drive toward Japan through Iwo Jima, Okinawa, and air raids on the Japanese homeland. While covering the invasion of Okinawa, Bunker Hill was struck by two kamikazes in quick succession, setting the vessel on fire. Casualties exceeded 600, including 346 confirmed dead and an additional 43 missing, the second heaviest personnel losses suffered by any carrier to survive the war after Franklin. After the attack, Bunker Hill returned to the U.S. mainland and was still under repair when hostilities ended. After the war, Bunker Hill was employed as a troop transport bringing American service members back from the Pacific, and decommissioned in 1947. While in reserve the vessel was reclassified as an attack carrier (CVA), then an antisubmarine carrier (CVS) and finally an Auxiliary Aircraft Landing Training Ship (AVT), but was never modernized and never saw active service again. Bunker Hill and Franklin were the only Essex-class ships never recommissioned after World War II. Stricken from the Naval Vessel Register in 1966, Bunker Hill served as an electronics test platform for many years in San Diego Bay, and was sold for scrap in 1973. An effort to save her as a museum ship in 1972 was unsuccessful. Bunker Hill was laid down on 15 September 1941, as hull number 1509 at the Bethlehem Steel Company's Fore River Shipyard, Quincy, Massachusetts` and launched on 7 December 1942, sponsored by Mrs. Donald Boynton. 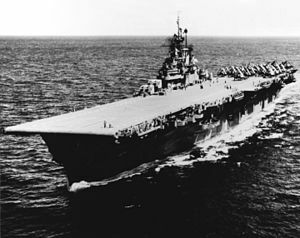 The carrier was commissioned on 25 May 1943, with Captain J. J. Ballentine in command. The carrier took aboard her air group at Norfolk, Virginia at the end of June, and on 15 July sailed south to Trinidad on her shakedown cruise. Three weeks later the ship returned to Norfolk, and on 4 September sailed south to the Panama Canal on the way to San Diego, Pearl Harbor, and the Pacific Theater of Operations. Bunker Hill had worked up with VF-17, a new fighter squadron flying F4U Corsairs. The Corsair, a new airplane, had some difficulties in its development, and the navy gave consideration to replacing VF-17's Corsairs with Grumman F6F Hellcats. The squadron successfully argued for retention of its Corsairs, as they felt they were better combat aircraft. Hence Bunker Hill had departed for the combat theater with VF-17 and its Corsairs aboard. While en route from San Diego to Pearl Harbor the pilots found that the Navy had decided not to use Corsairs aboard carriers, to avoid carrying parts and supplies for two fighters (the Corsair and the Hellcat) and with the challenges the U.S. Navy was having in getting Corsairs approved for carrier use at that time. (The British Royal Navy's Fleet Air Arm had developed an appropriate landing technique for its shipboard Corsairs by very early 1944, using a curving approach that kept the LSO (landing signal officer) in view while coming aboard, and had been adopted by the U.S. Navy by late 1944) VF-17 was ordered to the Southwest Pacific, where it was land-based. It was replaced aboard Bunker Hill by VF-18, whose men and Hellcats had also been ferried aboard the carrier from San Diego to Pearl Harbor. Bunker Hill departed Pearl Harbor on 19 October en route to the Southwest Pacific. The carrier's air group participated in the air raid on the major Imperial Japanese Navy base at Rabaul, along with USS Essex and USS Independence on 11 November 1943. During the mission the carriers' fighters (VF-18) escorted bombers to Rabaul, and CV-17 was reunited with VF-17, then land-based at Ondonga Airfield in the Solomon Islands. The tailhooks were reinstalled on the squadron's Corsairs, enabling them to land and refuel on their former ship while providing air cover to the task force as its own planes were escorting the raid on Rabaul. On 14 November the carrier set a course for the Gilbert Islands to cover the invasion and occupation of Tarawa. 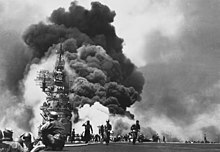 Bunker Hill went on to air raids on Kavieng in support of the amphibious landings in the Bismarck Archipelago (25 December 1943, 1 January, and 4 January 1944); air raids in the Marshall Islands (29 January – 8 February); the large-scale carrier air raids on Truk Atoll (17–18 February), during which eight I.J.N. warships were sunk; air raids on the Marianas Islands (Guam, Saipan, and Tinian) (23 February); air raids on Palau, Yap, Ulithi, and Woleai in the Palau Islands (30 March – 1 April); raids in support of the U.S. Army landings around Hollandia (21–28 April); air raids on Truk, Satawan, and Ponape in the Caroline Islands (29 April – 1 May), and combat operations in the Marianas in support of the amphibious landings on Saipan and Guam (12 June – 10 August), including the titanic Battle of the Philippine Sea, just west of the Marianas. On 19 June 1944, during the opening phases of the landings in the Marianas, Bunker Hill was damaged when the explosion of a Japanese aerial bomb scattered shrapnel fragments across the decks and the sides of the aircraft carrier. Two sailors were killed, and about 80 more were wounded. Bunker Hill continued to fight, with her antiaircraft fire shooting down a few IJN warplanes. During the Battle of the Philippine Sea, about 476 Japanese warplanes were destroyed, nearly all of them shot down by Navy Grumman F6F Hellcat fighters, such as those carried by Bunker Hill. During September, Bunker Hill carried out air raids in the Western Caroline Islands, and then she and her task force steamed north to launch air raids on Luzon, Formosa, and Okinawa, through early November. On 6 November 1944, Bunker Hill steamed eastward from the forward area, and went to the Bremerton Naval Shipyard, for a period of major overhaul/upkeep work and weaponry upgrades. The carrier departed from the Port of Bremerton on 24 January 1945 and returned to combat area in the Western Pacific. Stopping at Pearl Harbor on the way, the carrier took aboard Carrier Air Group 84, which included VF-84, a new squadron built around a nucleus of veterans of VF-17, the carrier's original squadron. In 1945, Bunker Hill was the flagship of Task Force 58, commanded by Vice-Admiral Marc A. Mitscher. Commodore Arleigh Burke was his Chief of Staff, and the admiral's staff all were accommodated aboard the carrier. In the task force's final drive across the central Pacific, Bunker Hill operated with the other fast carriers and their screening gunships in the Battle of Iwo Jima, the 5th Fleet raids against Honshū and the Nansei Shoto (15 February – 4 March), and the 5th Fleet's support of the Battle of Okinawa. On 7 April 1945, Bunker Hill's planes took part in an attack by the Fast Carrier Task Force of the Pacific Fleet on Imperial Japanese Navy forces in the East China Sea. The carrier's aircraft had located the Japanese battleship Yamato, the largest in the world, which had not been seen since the Battle of Leyte Gulf the previous year. In Operation Ten-Go the battleship, screened by one light cruiser and eight destroyers, steamed toward Okinawa to interfere with the Allied invasion of that island. The aircraft of the task force attacked and sank Yamato, the cruiser, and four of the destroyers. On the morning of 11 May 1945, while supporting the invasion of Okinawa, Bunker Hill was struck and severely damaged by two Japanese kamikaze planes. 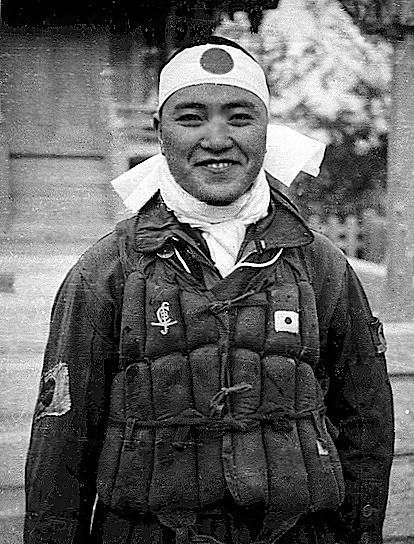 A Mitsubishi A6M Zero fighter plane piloted by Lieutenant Junior Grade Seizō Yasunori emerged from low cloud cover, dove toward the flight deck and dropped a 550-pound (250 kilogram) bomb that penetrated the flight deck and exited from the side of the ship at gallery deck level before exploding in the ocean. The Zero next crashed onto the carrier's flight deck, destroying parked warplanes full of aviation fuel and ammunition, causing a large fire. The remains of the Zero went over the deck and dropped into the sea. Then, a short 30 seconds later, a second Zero, piloted by Ensign Kiyoshi Ogawa, plunged into its suicide dive. The Zero went through the antiaircraft fire, dropped a 550-pound bomb, and then crashed into the flight deck near the carrier's "island", as kamikazes were trained to aim for the island superstructure. The bomb penetrated the flight deck and exploded in the pilot's ready room. Gasoline fires flamed up and several explosions took place. Bunker Hill lost a total of 390 sailors and airmen killed, including 43 missing (never found), and 264 wounded. Among the casualties were three officers and nine enlisted men from Mitscher's staff. The admiral relinquished command by visual signal; he and his remaining staff were transferred by breeches buoy to destroyer English and then to Enterprise, which became the flagship. The bomb carried by the second kamikaze penetrated to the pilots' ready room, and 22 members of VF-84 lost their lives in the attack. 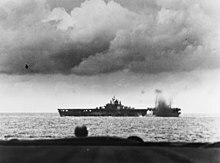 Bunker Hill was heavily damaged but was able to steam at 20 knots to Ulithi, where the Marine pilots of VMF-221, who had been aloft during the kamikaze attack and were diverted to other carriers, rejoined their ship. The carrier returned home by way of Pearl Harbor, and was sent to the Bremerton Naval Shipyard for repairs. She was still in the shipyard when the war ended in mid-August 1945. On 27 September 1945, Bunker Hill sailed from Bremerton to report for duty with the Operation Magic Carpet fleet, returning veterans from the Pacific as a unit of TG 16.12. The vessel made return trips to the west coast from Pearl Harbor, the Philippines, and Guam and Saipan. In January 1946 the ship was ordered to Bremerton for deactivation, and was decommissioned into reserve on 9 January 1947. While in reserve Bunker Hill was reclassified three times, becoming CVA-17 in October 1951, CVS-17 in August 1953, and AVT-9 in May 1959, with the latter designation indicating that any future commissioned operations would be as an "Auxiliary Aircraft Landing Training Ship". As all Essex-class carriers survived the war, Bunker Hill was surplus to the needs of the navy. She and Franklin, which also had sustained severe damage from an aerial attack, were the only aircraft carriers in the Essex-class that did not experience any active service after the end of World War II. Although their wartime damage had been successfully repaired, it was their resultant like-new condition which kept them out of commission, as the Navy for many years envisioned an "ultimate reconfiguration" for Bunker Hill and Franklin which never took place. Stricken from the Naval Vessel Register in November 1966, Bunker Hill was used as a stationary electronics test platform at the Naval Air Station North Island, San Diego, during the 1960s and early 1970s. On 2 July 1973 the vessel was sold for scrap to Zidell Explorations, Inc. of Oregon. Some relics survive. Six hundred tons of steel armor plate, manufactured before the atomic age, are used by Fermilab to shield experiments from interference by ambient or background subatomic particles. Dome-shaped protective shrouds from the carrier's mothballing were incorporated in a residence in West Linn, Oregon. Less altered in form is the ship's bell. It was purchased from the scrapper, displayed for a while at the San Diego Air and Space Museum, and in 1986 was installed in a new guided missile cruiser which bears the name USS Bunker Hill. Bruce Meyers served aboard Bunker Hill during World War II. He survived the May 1945 Kamikaze attack, and would go on to create the original fiberglass dune buggy, the Meyers Manx. Paul Newman, as a radioman-gunner in a Grumman TBF Avenger torpedo bomber, served aboard USS Bunker Hill during the Battle of Okinawa in the spring of 1945. Card Walker served as Flight Control 1943–45. He returned to work at the Walt Disney Studios after the war, eventually becoming CEO, President, and finally Chairman of the Walt Disney Company. Walker retired from the Disney Board of Directors in 2000, having served 50 years on the board. Of the original crew, he was the only flight deck officer who survived the war. Henry McIlhenny served aboard the ship for almost a year and a half at the end of World War II. ^ President on Tour, 1945/06/25. Universal Newsreels. 1945. Retrieved 20 February 2012. ^ Blackburn (1997), pp. 73–77. ^ O'Leary, Michael (1980). United States Naval Fighters of World War II in Action. Poole, Dorset UK: Blandford Press. p. 111. ISBN 0-7137-0956-1. ^ Blackburn (1997), p. 83. ^ Bowman (2002) p. 39; Blackburn (1997), pp. 130–47. ^ Jacobs, Jan; Tillman, Barrett (August 1990), "The Wolf Gang: A History of Carrier Air Group 84", The Hook, 18 (special), p. 84 . ^ Tillman (1997), pp. 46–47. ^ Udoff (1994), p. 69. ^ Udoff (1994), pp. 26, 69. ^ "USS Bunker Hill (CV-17)", Aircraft Carrier Photo Archive, NavSource online. Retrieved 17 May 2016. ^ "Navy Vessels on duty at Fermilab", US Navy contributions to FNAL, Fermilab History and Archives Project, sourced from The Village Crier Vol. 7 No. 14, 3 April 1975. ^ Eastmen, Janet, Oregons's 9-dome hobbit house built my a mime is being sold in bankruptcy court. The Oregonian/Oregon Live, March 23, 2018. ^ "The Father of the Dune Buggy Rides Again – Feature". Car and Driver. 12 March 1926. Retrieved 31 August 2012. ^ "Henry P. McIlhenny Papers" (PDF). pp. 5–6. Retrieved 7 September 2018. Philadelphia Consortium of Special Collections Libraries (January 31, 2017). Belote, James and Belote, William. Titans of the Seas. New York: Harper & Row, 1975. ISBN 0-06-010278-0. Bergerud, Eric M. (2001). Fire in the Sky: The Air War in the South Pacific. Westview Press. ISBN 0-8133-3869-7. Blackburn, Tom and Hammel, Eric. The Jolly Rogers: The Story of Tom Blackburn and Navy Fighting Squadron VF-17. Pacific, California: Pacific Military History, 1997. ISBN 0-935553-67-3. Cook, Lee. The Skull & Crossbones Squadron: VF-17 in World War II. Atglen, Pennsylvania: Schiffer Publishing, 1998. ISBN 0-7643-0475-5. Friedman, Norman; Baker, A. D III (1983). U.S. Aircraft Carriers: An Illustrated Design History. Annapolis: Naval Institute Press. ISBN 978-0-87021-739-5. Tillman, Barrett, U.S. Navy Fighter Squadrons in World War II. North Branch, Minnesota: Specialty Press, 1997. ISBN 0-933424-74-4. Udoff, Irv. The Bunker Hill Story. Paducah, Kentucky: Turner Publishing, 1994. ISBN 1-56311-168-3. Wikimedia Commons has media related to USS Bunker Hill (CV-17). USS Bunker Hill, Nav source .